The Beeches was a building at 519 Barnsley Road. It had seventeen rooms over four storeys, including a stables underneath, and had a chequered history. the overseer of the poor in the workhouse, as part of the dispenser’s department, as part of the children’s workhouse, as a local children’s club in the 1930’s and for fire watching activities by the Air Raid Precautions in World War 2. 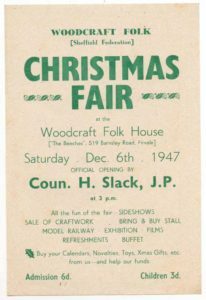 According to The Star, on 22nd December 1945 the Lord Mayor CW Gascoigne officially reopened the Beeches as Woodcraft Folk House. The Woodcraft Folk was (and remains) an organisation for young people promoting world peace and understanding. 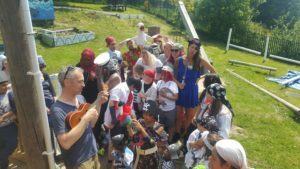 Thousands of young people were to come through the doors of Woodcraft Folk House, with many young visitors coming from Woodcraft’s sister organisations around the world, especially from eastern European countries. The Woodcraft Folk’s “Rock” reads: “This shall be a bond between us; that we are of one blood. you and I; that we have cried peace to all and claimed kinship with every living thing; that we hate war, sloth and greed, and love fellowship and that we will go singing to the fashioning of a new world”. Sadly the building suffered from subsidence and was demolished in 1968.There is little to see of it today.